The client approached Owen Clarke Design for a high performance day boat design to sail himself, with a small number of guests, no particular limit to overall length specified and completed to a superyacht level of finish . The design emphasis was to be on external deck space, performance and a minimalist interior. The yacht needed to be easy to handle with a maximum of three crew (handling the downwind gennakers once on the deck being one of the parameters that decided the final overall length) but also able to be sailed and/or a watch kept by one. Any crew was to have basic accommodation in case of the need to stay onboard at night, at anchor or for security reasons. There was no specific requirement for the owner to sleep aboard but there had to be an interior saloon for relaxation and interior dining. During the concept design process OCD suggested the possibility of providing an ‘occasional’ sleeping solution that could be discreetly hidden from view during the day. This was welcomed by the client into the design specification. 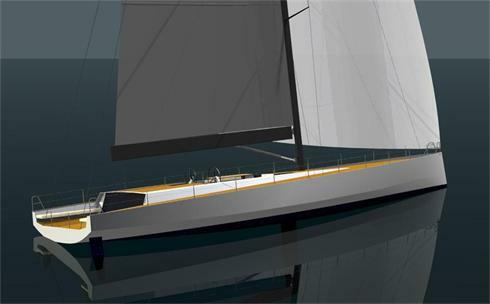 The weight of the interior fit is intended to be less than that of a conventional high performance racer-cruiser and this lends itself to the fitting of a canting keel because the fin and bulb will form a high % of the available righting moment of the yacht. The canting keel also has the potential to provide benefits when cruising in light airs as it can be canted to leeward helping to keep sails full and maintain boat speed (instead of turning on the engine early). When sailing in moderate breeze a canting keel can also be used to sail the boat under-powered, relatively flat and comfortable while providing a substantial % of the yacht’s righting moment and so still attaining good cruising speeds. Access to some harbours and bays will require a reduced draft and hence the keel to be lifting as well as canting, a technology that OCD have proven experience of providing. Keel: Fabricated CNC machined stainless steel, lifting and canting. Rig: Classic 38m air draft, carbon rigging, minimalist two spreader geometry with backstays controlled automatically by a Magic Trim system, slab reefing V boom. Gennakers: No bowsprit, furling gennakers and a top-down furling spinnaker, sails tack from the dreadnought bow, maximising length overall, minimising complexity. Daggerboards optional: Either limit keel cant to @20 degrees, fit a central gybing board, or twin hydraulic actuated daggerboards for optimum performance. Powering: Emphasis to be given to means of natural ventilation, to enable 100% eco-powering and electrical generation as per latest Owen-Clarke Open 60. Anchoring: Throw arm – under-deck stowage or Wally type submarine anchor. Deck systems: Push button, hydraulic winches and Magic Trim system. For this design we started with something very akin to the hull of the 84, adjusted it for the displacement/length ratio and produced a dreadnought bow. Among the main factors driving the style of the exterior is the ‘terrace on the sea’ as this area of the accommodation drives the head height and cockpit coaming in the aft 25% of the yacht. The hull form, in this case utilising twin rudders, is driven by the requirement for righting moment to balance the tall rig that is designed to power the yacht even in the light breeze associated with the Mediterranean and north east coast of the USA. 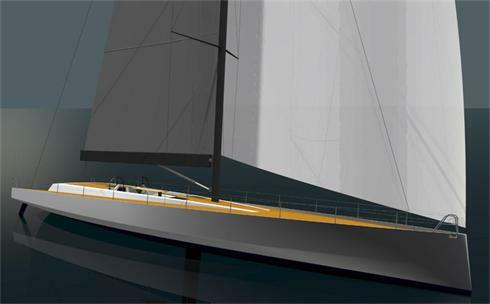 When setting the waterline beam, this light airs performance was a factor along with the stability required for easy manoeuvring with the canting keel in moderate breeze. As this type of yacht is a custom design we can re-style the exterior in any format. In this case, with the ‘terrace on the sea’ option the layout lends itself to a mid cockpit. With the hull form based on our successful open class racing boat designs it has a hard chine and we have allowed this theme to flow through into the styling of the deck and superstructure. The aft terrace is a secure lounging and relaxation space providing access to the saloon and up on to the side decks. The twin wheels, working cockpit and exterior dining area are in the centre of the yacht above the machinery space. Twin hydraulic primary winches and a single hydraulic pit winch provide for gennaker sheets and halyards. The headsail sheets, mainsail sheets and running backstays are controlled by a push button ‘Magic Trim’ system which permits ‘automatic’ tacking and gybing. A hydraulic lifting table (hidden beneath the cockpit floor) caters for 6/8 persons and the modular cockpit seating can be located towards the cockpit centre allowing serving space from behind. Access to the crew and food preparation area is forward on the port side down the crew companionway. A dummy hatch/window for cosmetic purposes provides light and natural ventilation into the crew area on the starboard side. A retractable awning system concealed within the cockpit coaming surround completes this area of the yacht. The main entrance to the aft saloon/owner’s day and night cabin is from an off-centreline pneumatic sliding glass door in the aft deck and window with four steps down. This area consists of a lounge area to starboard and a dining area to port. The starboard seating is modular and can be adapted to increase the number of places available for interior dining to 6/8. The ‘occasional’ owner’s double berth is a folding queen size bed hidden behind the seating in the dining area. The head and shower space situated on the starboard side can be either private or used as a dual day head. There is access to the cockpit on the forward face of the bulkhead via six steps and a sliding pneumatic hatch. The two entrances also act as natural ventilation for the aft saloon. Hull windows and removal of the direct access to the cockpit are among the options for this space. A passageway forward on the port side to the crew area provides excellent access to the machinery space as well as optional provision for additional crew in pipe cots if racing offshore. Fit out is in keeping with the requirement for light displacement and minimalistic interior. The centre of the crew area is taken up by a full floor to deck-head keel trunk, keel stepped mast and half height keel ram compartment. The centre of the crew area is taken up by a hull to deck-head keel trunk, keel stepped mast and half height keel ram compartment. The captain’s cabin is amid-ships on the starboard side, with excellent access to the machinery space. Access is a crouch space @ 1.5m high over the top of the keel ram box. There is a crew sleeping area to starboard with a head (which may double as a guests day head if the owner’s area remains private) and crew mess to port which doubles as a food preparation/serving area. There is a small galley with two burners and a sink in keeping with the day-boat theme. Refrigeration and storage space can be created as required. The aft lazarette contains the twin rudder steering system as well as useful stowage space to augment side deck lockers. Beneath the foredeck there is a large self draining dinghy garage and general stowage space with access to via a ‘bomb-bay type deck hatch. Either side of the dinghy garage two separate deck lockers provide storage for downwind sails. Forward there is additional space set aside for the bow thrusters, anchor windlass, rope and chain locker. There is sufficient space for either a conventional ‘extending arm’ anchoring arrangement or a Wally type ‘submarine’ anchor. .
As with the majority of yacht design companies it is normal to undertake the interior design and exterior styling of the yacht in-house. However, owners are encouraged if they have a preferred stylist to invite them to work in conjunction with Owen-Clarke to develop further the interior and exterior styling of the yacht. In this way a client may select a studio that they think best reflects their tastes or one that they have worked with on a previous project.